Sean Shar-Lev (on right), owner and chef of Sushiya, a genius in Japanese cuisine, is fluent in both English and Hebrew with a great customer service attitude. 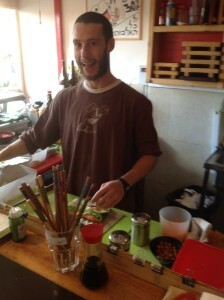 You’ll enjoy a wonderful variety of both raw and cooked sushi at his shop off Bezalel Street. Sean is also a disc-jockey who loves great classic rock, R&B and a variety of cool music which he plays day and night. He’s a real people-person and therefore a natural in the restaurant trade. Sean previously worked in Burgers Bar, where he obtained basic food service training. Then, at this cozy sushi spot, Sean began working part-time while in school to learn this new cuisine with a chef from Japan. When the restaurant changed owners, Sean joined with two new partners and took over ownership a few years ago. Somehow, even using some of the most expensive ingredients, Sean has been successful in charging affordable fast-food prices. At Sushiya, one can have a complete, filling meal with entreé and soup for under 40 nis. Sean also pointed out to our Wellness Jerusalem writer that the menu doesn’t contain any specific dishes. It is based on whatever they have daily in fresh fish and veggies. “Usually people tell us what not to put in! 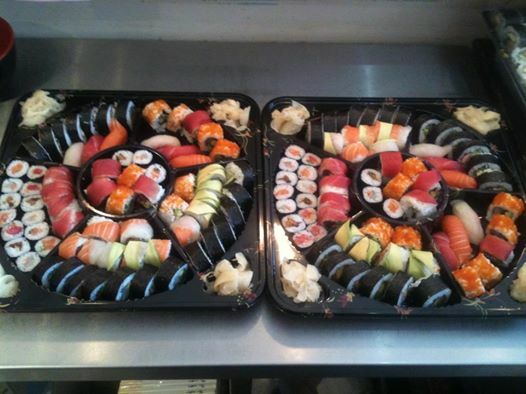 We make special, custom meals with loads of creative flair. People rely on us to make high quality food. We appreciate anyone who comes with a specific craving or request, yet somehow, our customers learn to trust our creative talents to design an amazing combination of what ‘they are expressing in words’ which we understand in flavors and presentation. “The result is that they just keep returning with more of their friends each time! “Currently, our latest renovation will provide more seating with wonderful pristine woodwork, yielding a beautiful ambiance with the feel of 16th century Japan. We expect it to be completed in March 2015. “Baruch Hashem, business is good. I’m in it for the lifestyle and simcha of serving others, not to get rich. The goal isn’t making money, it’s to enjoy what we’re doing,” concludes Sean. “Everybody is welcome to our happy hour between 7 and 9 pm every night, with 30% off alcohol. We have good music and good vibes! WellnessJerusalem Fmember get FREE miso soup with every main course meal! Sushiya is a very trendy happening spot on the Nachlaot scene. WellnessJerusalem writers eat there regularly and we give it our “5-star thumbs-up” as a happy affordable place to eat and hang-out. To order take-out, call 02-625-9055 or visit this great spot located at #1 Trumpeldor off of Bezalel Street street. Open every day for lunch and dinner, except Shabbat.